Recalling her days of growing up in humble circumstances, United States First Lady Michelle Obama on Sunday asked students to 'dream big', not just for themselves but for their communities. "I want to encourage you to keep dreaming big, gigantic dreams, not just for yourself but for your communities," Michelle said in her opening address at an interaction President Barack Obama had with students at the prestigious St. Xavier's college in Mumbai. "When I was your age, I never dreamt of traveling to countries like this and meeting young people like you. I never dreamt of serving as First Lady," she said. "I grew up in a working class neighbourhood of Chicago. My parents worked hard. Even though they could not give us material things, they gave us something more precious; they gave me and my brother strong values. They taught us to push for excellence in every single thing we did," she said. Michelle, 46, said her parents taught her to be humble and to put in every possible effort in education. "They taught us that our circumstances cannot define us. That if we believe in ourselves, we could make our own destiny. I have tried every single day to take these lessons to heart," she said. "I have really been looking forward to this trip for a very long time. You are here today and you should work here every day to fulfill your dreams," she said. "Pretty soon, responsibilities for building our future will fall on you. We will be looking to you to protect our planet, to lift up our vulnerable citizens. I believe you and your peers around the world are more than up to the challenge because I have seen it first hand in India," Michelle said. "As First Lady, I try my best to engage young people not just in the US but around the world. We need them to solve the great challenges of our times," she said. "That is why, President Obama doesn't just meet heads of state, but also always meets young people like you," she added. 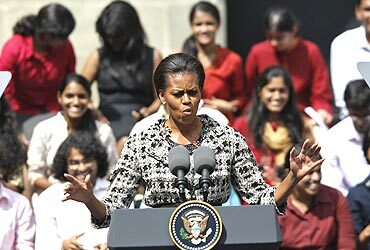 "Right now, more Indian students come to study to the US than any other country in the world," Michelle said. Inviting students awaiting her husband's turn to speak, Michelle said, "I urge you to ask (him) some tough questions. This brightens his day." She ended with, "I introduce you to my husband, the President of the United States Barack Obama," and Obama joined his wife on stage, amid thunderous applause from the students.